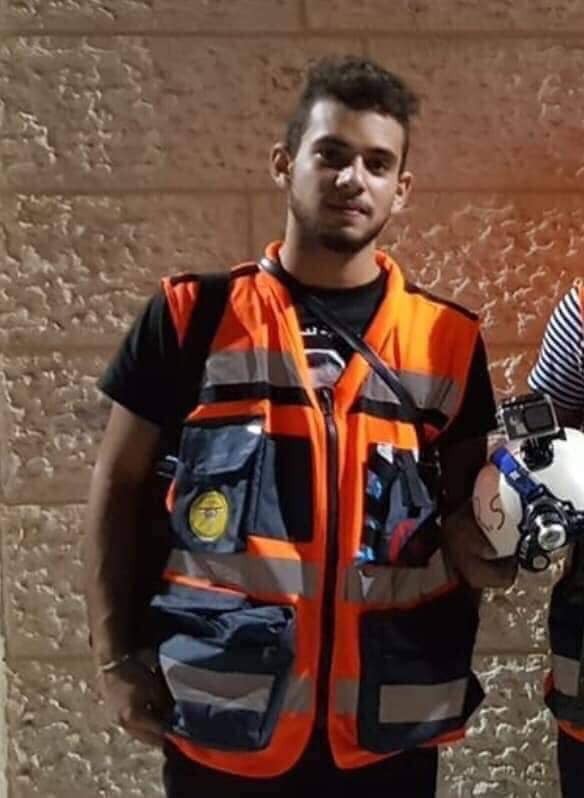 A young paramedic volunteer on Wednesday morning was killed by Israeli fire during clashes that broke out in Dehehisheh refugee camp south of Bethlehem, central West Bank, wearing his medical relief uniform. The father of the martyr Sajed Mezher, Abdul-Hakeem Mezher narrated to PNN the last moments of the martyr’s life and his determination to extend a helping hand to the wounded youths in the clashes. The father of the martyr said that he woke up at dawn and was preparing his sons to go to their schools. Among them was the martyr Sajed, who was studying for a university exam. At the outbreak of clashes, Sajed insisted on going out and helping the injured with the paramedic crews. Popular committees announced a general strike following the killing of Mizher, who was buried in his last resting place at the Martyr’s Cemetery in Irtas village. Clashes also broke out at the northern entrance of Bethlehem following the funeral.